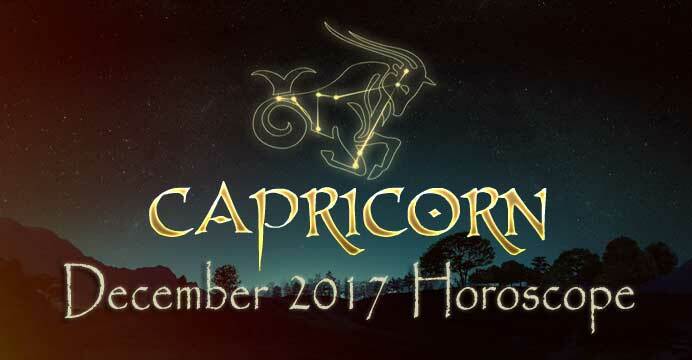 Capricorn December 2017 Horoscope | Capricorn Life - Capricorns Rock! This will be a landmark month, for Saturn, your ruling planet, will enter Capricorn on December 19, for the first time since 1988 to 1991. At some point during the coming three years, you will make a major commitment to a goal you’d like to pursue. You will commit to something you’ve not done previously, but it will represent an exciting decision, and that will change your life in a wonderful way forever. You may get married, buy a house, do a full scale renovation on a house you are in now, go to graduate school, write a book or a thesis, or move across the country – you get the idea. Any of these goals requires planning and the ability to handle responsibilities new to you. Saturn will require a strenuous effort, but if you concentrate and work eagerly to please Saturn, by the time Saturn moves out of Capricorn in December 17, 2020, you will turn yourself into a force to be reckoned with. Others will pay you respect and admiration. You will not get rewards during the time Saturn spends with you but rather Saturn will give you his gift as thanks for dealing with his rigors as Saturn departs. You, of all signs, deal very well with Saturn’s requirement to completely devote yourself to your goal, for Saturn rules Capricorn. Next month, the world will see a very rare alignment of six planets in Capricorn. That will happen on the new moon January 16, with the Sun, Mercury, Venus, Saturn, and Pluto. This makes January a highly unusual month that will put you in the center of all that will be happening. For now, December will be a month for observation, planning, and reflecting. You have a number of planets in your twelfth house, which puts the spotlight on behind the scenes activities. If you have to finish research or a report or manuscript, you will feel the pull away from the office to work in a quiet environment, such as at home, a library, or a solitary cabin in the woods. Your schedule will almost certainly open up when a number of last minute cancellations or postponements happen as Mercury retrogrades, December 3 to December 22. The month’s focus will be more on correcting past decisions and projects than to start new ones. You won’t get clear directives now, so don’t rail against other’s fuzzy answers, but rather laugh when Mercury retrograde causes things to go haywire. This is one aspect that affects us all in the same way. Make sure you know where your mobile phone is at all times, plus all the other electronic treasures you own, for you will be busy and distracted. You could lose something you need and love in this haywire atmosphere of December, so stay on your toes. Do not purchase electronics, appliances, a car, or other machine with moving parts until at the very end of this month or in January. Shopping for gifts will be challenging, and holiday returns will later be on the rise. You may consider the idea of having prints made of your friends or family’s best photos or assembling them in a book, or making a music mix. There will always be ways to work around obstacles. The full moon, December 3, will bring an important communication-oriented project to culmination, but with Neptune in hard angle, you may have to redo parts to clarify your meaning or to correct inaccuracies. Saturn will conjoin Mercury at this time, too, so you will need to concentrate deeply without co-worker distractions. This is one time an open door policy will be the wrong approach. As funny as this advice sounds at holiday time, be inaccessible until the project is done, which will be no later than December 6. In matters of romance, next month, in January, you will be the center of attention in all areas of your life. This will be almost a certainty, because of the rare buildup of six heavenly bodies in Capricorn. This month, although less dramatic than January, you will have the advantage of hosting Mars in Scorpio in your friendship sector, which will go a long way to help you enjoy holiday festivities and the warmth of friends and family. You will have one very special day, Thursday, December 27, when Mars will be in sync with Neptune, producing a dreamlike evening when you may feel swept off your feet with happiness and in the rush of love. The transiting moon will be in Taurus, and that is a sign that blends beautifully with yours, making this day complete. The full moon of January 1 will fall in your opposite sign of Cancer, putting emphasis on your committed relationship, if you are attached. You will feel this full moon the day before, on December 31, heightening feelings of love and closeness. Some Capricorn couples will get engaged as the bell tolls the start of the New Year. No special someone? You can enjoy the night to the fullest by being with friends. If you are attached, let your partner make all the plans – it is always fun to be surprised, and besides, he or she has very good ideas this year. December will be a month that will allow you to catch your breath. You are coming up on a big month in January, for a crowd of planets right now are heading to your constellation and some have already arrived for this major cosmic event to happen January 16 – Venus, Mercury, Saturn, Pluto, Sun, and new moon. Back on May 3, 2000, we had seven planets in alignment in Taurus, but according to NASA, we will not have seven heavenly bodies in the same sign again in our lifetime. We will have six, however, and that will happen next month in your sign of Capricorn. You will be in the spotlight and the center of all that happens. For now, you need to allow yourself a slightly less pressured schedule. December has many quirky crosscurrents and confusing aspects, so it is just as well this will be a basically quiet month to stand at the sidelines and let others have the main attention. You need time to think and strategize your next move to make 2018 the important year you rightly sense it will be. If you rush to launch ideas or projects in December, your timing will be off. The month opens on December 1 with a tough aspect, Mars opposed to Uranus. This is an angry, volatile, and separating aspect that will cut across your career and home sectors. I wrote about this aspect at the end of my November forecast, for this is an aspect that nearly everyone will feel to some extent. Someone may push all your buttons, and you seem ready to speak your mind. Money seems to form part of the equation, for Uranus rules your eighth house of other people’s money, including commissions, one-time fees, royalties, bonuses, inheritance, venture capital, child support, and other such funds. You’ve been working very hard, so it is understandable that you may reach the breaking point if someone slights you by looking at you the wrong way. The good news is that the long stretch of long hours is about to abate, for action-oriented Mars will move out of your career sector and set up shop in your divinely social sector from December 9 to January 26. If you have any VIP you need to see to show a proposal, do so in the first week of December. After that first week, plan to partake of the festivities of the season. From December 9 onward, much of the work you already did starting in late October through early December will start to bear fruit. You need not tend your garden – it’s time to allow nature to take its course and to wait for those seedlings to grow. Astrology is based on balance, and after hard work, one has time to rest and enjoy life. You are lucky to have Mars in just the right place to connect with friends at the most celebratory time of the year. There is another reason to pull back a little. Mercury will be retrograde from December 3 to December 22, and you have already felt this approaching slowdown of Mercury for the past ten days or so. Mercury retrograde does have its benefits, but doing business and getting answers from VIPs is not one of them. The retrograde will be fun for you to reconnect with people from your past, particularly in terms of friends you’ve not seen in a long time. In terms of career, you are going to need patience, for people you need to reach will be out of touch or maddeningly indecisive. Don’t push against this trend, for if you do, you will not get anywhere and will only frustrate yourself. Go with the flow, accept that all of us are in the same boat, and just laugh at the comedy of errors that will surely show up. Of course, as I wrote in your November forecast, the backward move of Mercury is going to complicate your gift shopping. First, double check addresses before you go online to order gifts for those you love and also to those you want to show your appreciation for their help and good wishes to you all year. Do not buy electronics this month. If you didn’t get the electronic present for your relative or friend last month, then buy a gift card for the person, or send a note to promise to go shopping together at month’s end to pick out the perfect item. It would not be a good idea to do shopping at the last minute for your others on your list, for express mail services will struggle to keep up in this month of wild aspects. Companies like FedEx, UPS, DHL, the post office, and messenger services are all ruled by Mercury too, a point to consider. We often have very bad weather when Mercury is retrograde at this time of the year too, adding to the slowdown. You have a full moon, December 3 in Gemini 12 degrees, in your workaday sector, so it appears you will be finishing an important project that needs to be out the door in the first week, and at the very latest December 6. This full moon receives a difficult aspect from Neptune, in hard angle to the Sun and full moon. If you are charged with leading a team, be sure you understand all facets of the job, and that you transmit the instructions clearly to the staff reporting to you. The possibility for confusion will be very high. Take care of your health, for this project seems to require a strenuous effort, and may drain you. The new moon of December 18 seems to make you want to hibernate. Usually you are quite gregarious, but this holiday season, you will likely be content to borrow in at home and beg off all but the most important social engagements. You will have plenty of time to circulate in January’s birthday month, so you won’t lose out. The new moon of December 18 plus two weeks will be a good time to visit a professional therapist if you have any troubling thoughts or fears on your mind, or if you need help with handling the pressures of the month. That person would likely understand your concerns and would be on hand to give you understanding and comfort. If you were dependent on any substance, this would be the ideal time of the year to reach out to get help on that front too. Plant the seed by consulting a therapist just after this new moon. The monumental development of the month will occur on December 19 or 20 (depending on your time zone) when Saturn will move into Capricorn for the first time since 1988 to 1991. This is a vital three-year trend that will transform you. Saturn teaches us that the goals that we ultimately are proudest to say we achieved are always the ones that we worked the hardest to win. When we enter Saturn, we are expected to take on an important goal that will set a foundation for the coming three decades, or forever. You might be ready to marry, to buy your first house, or to make a major career move. You might write your first book, commit to graduate school, or take on the leadership in a humanitarian effort. These are just a few examples, and you might have an idea of what you might be doing next. No matter what one goal you have, you won’t be able to easily undo it later, nor would you want to do so. The whole point of tackling this goal is to create stability in your life, and have your time count for something big. The goal will also require you learn something completely new to you. For example, as anyone who has ever purchased a house knows, it requires a lot of paperwork, and lots of advice ahead of time from your broker, and perhaps from friends too. First time parents often have a lot of questions for friends and family to best care for the child. Any new lifestyle change requires learning and adjustment, but is also very exciting. Saturn will ask you to take a courageous step forward by choosing one goal within the coming three years. 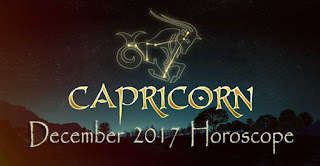 If your birthday falls in December, you will do this now, for you are an early born Capricorn. After you achieve what you have set your mind upon, you will feel more grown up, no matter what age you happen to be. Saturn will not force you to take on your new role – you will choose it because the benefits that will accrue to you eventually are so worthwhile. One possibly difficult day coming up will be December 21, when Saturn will conjunct the Sun. Most everyone will find this day deflating and exhausting. I am not sure you will agree with my assessment, however, because your ruler is Saturn. If anyone can find a way to deal effectively with Saturn’s demands, it’s you. On this day, December 21, you might find that money is tight, for the Sun is the natural ruler of your eighth house of money, which includes credit cards. This is a once-a-year aspect, and one you have not felt since 1991, so it will feel new. If you were a little child at the time, you didn’t feel it – you would have to have been a teenager to notice any aspects. I know the holidays have us all spending more, but this aspect can bring on a feeling of being overwhelmed. Or, the incident may affect you in a different way, and not have anything to do with money. Specifically, if someone criticizes you, you may become overly sensitive and possibly temporarily depressed. Your realistic, practical side allows you to rise above situations like this. A much better set of two days will come earlier, December 15-16, days that will center on good news about money, and this time, news will come suddenly and make you smile. One last note on Saturn in Capricorn: do all you can to build the strength of your bones and protect your teeth. If you cannot afford to see a dentist, consider calling a dental college to see if you can get much reduced fees for the care of your teeth. Also have frequent cleanings. In terms of love and romance, January will be your headline month, for it will brim with planets in Capricorn. You will have fun in December too, because Mars will be moving through your eleventh house of friendship, fun, and festivities from December 9 through January 26. This is sure to bring you invitations to mix and mingle with friends, whether through spontaneous lunches and dinners and unexpected invitations to holiday parties that you’ll enjoy to the fullest. One day near month’s end that will be a standout is December 27, when Mars and Neptune will create a dreamlike environment for a magical holiday evening. See friends, or be with your one-and-only love over a romantic dinner, or go to a concert or Broadway play, or simply take a nighttime walk together to see the lights in the pretty shop windows. The month closes with an approaching new moon in Cancer, January 1. By New Year’s Eve, you will feel the energy building. Many couples will get engaged that night, and you can – Mercury will be moving direct. Even if you are not getting engaged, this New Year’s Eve should be special for you. Let your partner make all the plans, and simply enjoy being surprised. Even if the two of you stay home and together cook up a beautiful dinner as the silent snow falls outside your window, it will be a memorable, romantic night that you will always remember. You don’t have to spend a lot of money to weave a memory. To my friends in Brazil, Australia, South Africa, Turkey, and other lovely countries where snow is unlikely, your evening will be just as sweet. I can easily get carried away with my vivid imagination. This time of the year is so wonderful!